Yves here. The UK pres has been so full of baseless rumors, like that the EU would “offer” a Brexit extension, that it seemed clear that the notion of reopening the Good Friday Agreement, particularly with so little time left on the Brexit clock, was daft. However, given how many Brexit unicorns are still wandering about, the people that floated that rumor really could have seen messing with the Good Friday agreement as an option, or alternatively, it could have been members of the Government seeking to create the impression that Theresa May has more options than she really does. 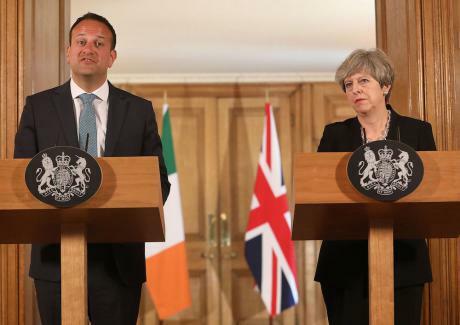 But regardless, as readers have pointed out in comments, the Brexit negotiations have proven to be an ugly wake-up to the Irish as to the ugly views of some Brits who ought to know better. History, Karl Marx famously quipped, repeats itself: first as tragedy, then as farce. That’s certainly true of Theresa May’s approach to Ireland. This past weekend began with a tragic misreading of Dublin’s position on Brexit– that London could somehow sign a bilateral deal with Dublin – and ended with farce: a proposal that the Good Friday Agreement could be “amended” to help the British prime minister’s deal pass the Westminster parliament. May, The Daily Telegraphreports, wants to see the 1998 peace accord rewritten to assure Ireland that the UK is committed to maintaining no hard border after Brexit. Leaving aside the lack of faith many in Ireland have in the promises of a government propped up by the Democratic Unionist Party (DUP), which opposed the Good Friday Agreement in the first place, the very idea of rewriting the agreement attests to a much wider failure to understand the island, both north and south of the border. The Good Friday Agreement effectively ended a conflict that cost more than 3,000 lives. Historic enemies agreed to share power and respect each other’s identities and beliefs. The genius of the agreement was compromise: everybody lost something, so everybody won something. Brexit is the exact opposite of that irenic spirit. It is politics as zero-sum game: a victory for me means a defeat for you. This approach is damaging enough in Britain, but it is potentially disastrous across the Irish Sea. Northern Ireland has been without a government for more than two years. This paralysis wasn’t caused by Brexit but the chaos in Westminster has clearly exacerbated tensions, reopening old questions about constitutional futures that the Good Friday Agreement had settled. A car bomb exploded in Derry on Saturday night. All this sententious talk of “sovereignty” can have very real effects in a divided society. Brexiters like to point out that the agreement barely mentions the border. There are two good reasons for this: first an entire section of the accord, strand two, deals with north-south arrangements; second, in 1998, with Labour in power, nobody sitting around the table even considered the possibility of Brexit. The UK government’s failure to appreciate this complexity was exemplified by David Davis during a recent sitting of the European Union scrutiny committee last week. Without a word of apology, the man at least nominally in charge of the Brexit process for two years told MPs that the government has had a “blind spot” when it comes to Brexit and Ireland. Yes, it is easy to miss a 310-mile-long land border. Troubles? What Troubles? With hindsight, Davis said, Number 10 should have put more resources into what used to be called ‘the Irish question’ back when it divided the Tory party in the 19th century. But it was not all his fault. Britain had been “unpredictably handicapped”. Ireland had changed Taoiseach. The power-sharing government in Belfast had collapsed. Yep, that’s right. If only Leo Varadkar hadn’t come along, pursuing the exact same Brexit strategy as his predecessor Enda Kenny. If only the Northern Ireland Executive was still up and running. Blaming the Irish for Britain’s chaos has become a popular pastime for many on the Tory right. “Leo shut your gob,” demanded The Sunlast year. Perfidious Paddy is widely seen as standing in the way of the great British Brexit. But what lies behind this caricature? Is it simple ignorance of Ireland, a failure to grasp that Irish interests are no longer directly aligned with that of the old colonial master? Or is there something more malign? Just weeks after the Brexit vote David Davis – him again – told journalists that the UK had an “internal border” with Ireland. Only after becoming Northern Ireland minister did Karen Bradley discover that nationalists and unionists tend to vote for parties that share their views on the constitution. She is 48 years old. But such comments speak more of witlessness than mendacity. It is the Irish backstop – the Brexiters’ bete noire – that has brought out the nastier side of Britain’s ruling elite when it comes to Ireland. An arrangement for avoiding customs check on the Irish border has been reframed as a Machiavellian plot to carve up Theresa May’s “precious union”, hatched by Brussels bureaucrats and irredentists in Dublin. That many of the proposed checks already take place does not seem to matter. Listening to many Tory MPs, and to some journalists, it often seems that understanding of what the benighted backstop actually means is pretty thin on the ground in the Westminster village. The failure to grasp the realities of everyday life in the shadows of what Winston Churchill disdainfully dismissed as the “dreary steeples of Fermanagh and Tyrone” is hardly surprising. Northern Ireland voted to remain in the EU, yet the only voice we hear from Belfast is the DUP’s. The unionists’ putative leader, Arlene Foster, blithely declared last week that there never was a hard border in Ireland. I was surprised by that. Growing up 40 miles south of the border, on shopping trips to Enniskillen we used to pass checkpoints armed by callow squaddies touting rifles. Maybe I am suffering from false memory syndrome. The border has changed, of course. Theresa May has repeated ad nauseam that there will be “no return to the borders of the past”. I hope she is right. Beyond dissident republican splinter groups, nobody wants to see a return to barbed wire and bombed-out roads. But what has Britain’s existential crisis done to the borders of the mind? I’ve lived in the UK for over a decade, one of hundreds of thousands of Irish people to carve out lives in our own near abroad. But even before I moved to Edinburgh to study I was inculcated in British culture: we grew up watching the BBC, supporting English football teams. I have clearer memories of Tony Blair’s first general election victory than of any of Bertie Ahern and Fianna Fáil’s succession of triumphs. No wonder my generation of Irish immigrants found it so easy to settle in Britain. There was no discrimination to be faced. No racist signs in boarding-house windows. We came to this country as equals. Or so we thought. Brexit has revealed that some of our neighbours have a very different view of us. Paddy the fifth column. Untrustworthy, even traitorous. Maybe this minority was always there, just hidden. Or perhaps, it has been recreated afresh by a national persecution complex that has taken hold in some quarters. And yet Britain’s relationship with Ireland points the way out of the current mess in Westminster. Perhaps we are too blunted by familiarity with the Good Friday Agreement to realise how remarkable it is. Three decades of violence ended by dialogue and compromise. But many Conservatives, particularly in both the pro-Brexit European Research Group, as well as the DUP would happily see the agreement picked apart. Michael Gove compared the Good Friday Agreement to condoning the desires of paedophiles. This weekend’s kite-flying about “amending” the agreement is not just dangerous, it also shows that the British government could be led by its most primitive passions, which could have serious consequences across these islands. This entry was posted in Brexit, Doomsday scenarios, Guest Post, Politics, Social values on January 22, 2019 by Yves Smith. blithely declared last week that there never was a hard border in Ireland. The idiocies are coming fast and furious. Driving from the Republic to NI in the 1970’s, I clearly remember the guys in uniform with machine guns hanging on their shoulder controlling who came into NI, the watchtower with the machine gun equipped guards right across from the pub in the middle of town close to the border…no, no hard border, absolutely not. Yes, thats an astonishing statement – I’m old enough to remember just how terrifying it could be to cross the border – heavily armed soldiers checking each vehicle, random checks well inside the NI border, numerous stories of verbal and physical intimidation by bored and/or frightened squaddies. And this in addition to the normal customs and immigration checks. I remember as a student in a bus crossing NI to get from Dublin to Donegal and we were ‘escorted’ (i.e. followed) by an APC the whole way. It was hard not to see it as a form of deliberate intimidation (or possibly they thought we were going to a protest). I was surprised when I first came to the border in 1983 not to find any border control. Just as I was wondering whether the whole situation was exaggerated by American media, I came to the heavily armed checkpoint five miles up the road. So, perhaps the denial of a “hard border” is just one of those untruths later to be passed off as semantics. Thank you and well said, Peter. I recall them, too, from the 1980s. My father and godfather served there with the Royal Air Force. As the only non whites around were likely to be or associated with the British military, mum, my brother and I rarely visited. We went to Catholic mass on base, rather than join local parishioners, which would have been our preference. I had friends who died in NI. Also, being English did not understand the depth of the division in NI until I emigrated to ZA, and for the first time in my life had friends and acquaintances from all of Ireland. It was all caused by the wars of the roses, and the failure of Richard III to win the battle of Bosworth /s. It is complicated by the history, including Hery VIII’s break with the Catholic Chirch, which sparked huge changes in England because the Lords Temporal (Landowners) became the majority in the House of Lords, displaces the Lords Spiritual (Bishops and Abbots). However the attitude of the Lords (The Upper Class) towards the common people, that is contempt and fear, remains to this day. Thank you, Synoia. I know what you mean. Some of the upper class and others in Great Britain are displaced Anglo-Irish Ascendancy or hanger-on, vide the jockey Willie Carson. The former are well connected and retain some land across the Irish Sea, vide the Dukes of Westminster and Abercorn and Earl of Shaftesbury. The Earl owns the bed of Lough Neagh, but not the water. In the early 1980s, the BBC was often in trouble with the Tory government for its coverage of Northern Ireland, including one TV report which featured what’s left of the Ascendancy hunting foxes. The then director general of the BBC was Alasdair Milne, father of Corbyn’s adviser Seumas. The then chairman of the BBC was William Rees-Mogg, father of Jacob. Milne was fired. Seumas was a school boy at Winchester at the time. He was scarred by what happened to his father. One looks forward to meeting you. Totally understand your position but, if it makes you feel any better, the whole of the UK, in and outside London, is being treated with disdain. The PM is hell bent on Brexit whatever the cost BUT all thinking people know it must be stopped for everyone’s sake……and it will be. I’d not bet on it. The default position is no-deal Brexit, and there’s enough obstructionists in the government and Parliament to make sure it happens unless May gets an epiphany, or sufficient number of her MPs turfs her out. Both of which are extremely unlikely. (especially since the second option would also,if stopping Brexit is your goal, involve sufficient number of Labour MPs revolting against Corbyn). That said, I do suspect that May has some mental ilness (that’s not meant as a slight, but as an observation). I’ve begun explaining to people in the higher-up part of Labour activists (who know Corbyn and have for years) that a no-deal is being engineered (the media is softening us up and she is acting in a way that ensures a no-deal). They just can’t believe that T. May would do that. I think Corbyn looks at T. May as a rational actor and we have WELL passed that sell-by date. It can only be her stinking deal or no-deal. She is unable to get out of that box. She would rather send us down the hole of no-deal then to have some plan other than her own awful one. I thinks Yves’ observation about her being a high functioning Asbergers sufferer makes a lot of sense. Runciman’s piece in the LRB suggested she has a thing about completing tasks she is given, without questioning the task. As a hypothesis it would fit the observable facts. Harry, do you have a reference to the Runciman article in the LRB? Many thanks. I think Brexit must absolutely not be stopped – for everyone’s sake. Bandaging up the infected wound caused by the Brexit debacle will only cause the infection to fester and spread; The EU could well end up like the former Yugoslavia! Brexit has revealed that some of our neighbours have a very different view of us. Paddy the fifth column. Untrustworthy, even traitorous. Quite! And that goes double for anything and anyone “European”!! Is this a very sick sense of humour on display? Not really, Sorry. I think It has become very clear that the British feel very mistreated, they have a strong resentment for their European oppressors, they want some kind of satisfaction by leaving the EU and depriving their oppressors from abusing them further. If the UK/EU cancels Brexit it will be seen as “there being no escape”, there will be legends about “betrayal” like in post WW-I Germany and the resentment and hatred will just keep growing. If Brexit happens, the pressure will come off and then everyone will be very busy trying to solve the immediate problems caused by being totally unprepared for it, maybe even too busy for the next level of Brexiteer lies that will surely come, that the EU is “sabotaging” British trade deals and so on when it eventually becomes clear that the UK traded it’s 1’st class ticket for a 2’nd class one. About 50% of the British feel mistreated. Probably because they have been. No one spelled out that the EU would cause a huge relative shift in resources and wealth in favour of London. Trickle down seldom pleases its recipients. I think the British are misplacing their irritation. Most of them are not socialists so the EU is not constraining politics in a way which would irritate them. No-one spelled out that the EU would cause a huge shift in resources and wealth to London, because it didn’t. The huge shift in wealth and resources to London has been caused by Thatcher and the the post Thatcher governments of the UK as deliberate government policy. The reasons that the North of England and other deprived parts of the UK voted for Brexit is as a f**k you to the last 40 years of UK governments who have done nothing for them. Regarding the number of socialists in the UK, I wonder how this was measured. Indeed, I saw a study that shows the correlation between economic hit by leaving the EU and voting leave is very high – but I do not believe the people truly understood it. Moreover, I doubt that even if they were voting to “show it to the London”, they understood it’s not even cutting your nose to spite your face, it’s more of this – just look at the Camerons, Osbornes, Cleggs of this world – they will be ok no matter what Brexit will happen. The EU did not shift power to London – the truth is exactly the opposite. It was the EU that insisted that structural funding had to be distributed and managed on a regional level – London fought this long and hard but lost. It is EU funding that was core for Wales in particular to get more control over its economic agenda and to a lesser extent Scotland. Agricultural spending was the only major funding area that was managed by a Whitehall department, and by definition, this increased spending outside the major cities. In any event, almost all the powers the EU took (mostly trade related) were national level powers – the EU took almost no powers from local or regional levels. Under Thatcher Scotland was almost like a “third world” country in some respects – I clearly remember my first visit in 1988 after nearly a decade under the tender mercies of she who was not for turning: as soon as you crossed into Scotland from England by car the “motorway” was uneven and potholed and had obviously not been repaired for years. Heading north to Glencoe on holiday we got lost somewhere in the slums of Glasgow, where there were people passed out in the streets before midday. As an Australian of English birth the contrast between the south of England ,where my relatives lived ,and Scotland was shocking and confronting. After decades of the UK in the EU and several visits to both England and Scotland, where my second wife has relatives, there appears to be little if any difference in the overall standard of living between Scotland and at least most of southern England. Do not let the links to the left fool you as there are quite a few sub-links that lead off from them not seen until you click on them. “Perhaps we are too blunted by familiarity with the Good Friday Agreement to realise how remarkable it is.” This applies to the post war welfare state settlement and European project. As memories of hardship and war have become distant, perhaps the British people have come to take such matters for granted. Last summer, my employer hosted some PPE and history undergraduate interns, all since offered employment. It was staggering how their history education differed from when I was at school in the 1980s and university in the 1990s, but I also wondered if they read anything or talked to their elderly relatives. You will be pleased to hear that I recommended this site to them. “Brexit has revealed that some of our neighbours have a very different view of us. Paddy the fifth column. Untrustworthy, even traitorous. Maybe this minority was always there, just hidden.” On a Brexit thread last year, Clive and I wrote about how common anti-Irish comments were as late as the late 1990s. It’s not just the “elite”. Readers may recall the insensitive remarks by Priti Patel last year. Patel is of Ugandan Indian origin. A relative studied and worked in Uganda in the early 1960s. Dad recalls him, upon his return to Mauritius, saying that the Ugandan Indians have something coming when the British leave. This attitude has not changed. A friend and former colleague, French of Moroccan origin, was horrified, when on holiday there at the turn of the decade, to hear some Ugandan Indians disparage Africans. Ugandan Indian journalist Yasmin Alibhai-Brown has written about this. That colonial lapdog mentality travels well and can be found in Tory Brexiteers of African and Indian origin and USians like Kate Andrews and Janet Daley and Aussies like Amanda Platell and “low tax” Chloe as she styles herself, or as we call her “low fact” Chloe as we call her. With regard to the above comments by David Davis, a friend, also the child of Mauritian immigrants, was seconded from the Treasury to the UK mission to the EU from the autumn of 2016 to the summer of 2018. The Brussels team were relieved that Davis hardly ever came to Brussels and when he did, it was just to enjoy the coffee and continental pastries and smile for the official photo. Davis was on the lunchtime Eurostar and in time for supper with the Daily Mail’s Paul Dacre or a war film at home. He was, and remains, hard work and hard to work with, and obsessed with WW2 films, odd for someone asked to leave the army reserve. It’s an indictment of the UK MSM, and the opposition for that matter, that Davis’ ignorance, capriciousness and insouciance were rarely covered / exposed. The BBC’s Brussels office is almost next door to the Commission, across the road from the Council and down the road from the Parliament. One wonders what the overpaid and overrated hacks do with licence payers’ money? With regard to Karen Bradley’s comments, see also the comments about the port of Dover by Dominic Raab, another child of immigrants struggling to integrate. Bradley’s comments weren’t a surprise. I recall fellow students from the Republic of Ireland being asked what’s happening in Northern Ireland. The students replied that they did not know as Northern Ireland was British. Twenty years later, at Barclays, a Compliance MD and now head of financial crime at the London Branch of a US TBTF, asked me why my efforts to set up, scale up and repurpose the Irish subsidiary from being a Branch of the UK bank, in anticipation of MiFID II and Brexit, did not include the Belfast office. You truly are a mine of fascinating insider information! It is true that the children of immigrants often can unfortunately sometimes mix their prejudices in with those of the homeland of their birth in pretty unpleasant ways. Back in the early ’90’s I did voluntary work in providing professional advice in the very mixed Handsworth area of Birmingham. In those pre-internet days vitriol was written in pen and ink, not on social media accounts and it was just as nasty. I got quite an insight into the mutual views of afro-carribean, pakistani, indian, Irish, and other immigrant groups there. There were some great people there and also, shall we say, some not so great people. Of course Varadkar is similarly the child of an immigrant, although he is so self absorbed I doubt he is bothered with many prejudices, like most narcissists he welcomes everyones love equally. He was one of a clutch of up and coming politicians who were labled the Tory Boys as they rose through the ranks. I’ve commented here before, but one of the amusing experiences in the whole Brexit mess is witnessing the horror of the Anglophile establishment in Ireland (which includes Varadkars Fine Gael Party) at how their ideological soulmates in London actually really see them. The pearl clutching of the Irish Times at discovering that maybe Republicans had a point has been quite fun to see. With regards to the Tory Boys of Eire getting a rude education, yes, I have to find my dark pleasures somewhere. And watching them slowly realise what people really think of them is rather hilarious. Of course Varadkar is similarly the child of an immigrant, although he is so self absorbed I doubt he is bothered with many prejudices, like most narcissists he welcomes everyones love equally. Variant CJD is a virus? Has some new conclusive evidence come out for that recently? You may have a good point there Colonel. I’m 60 now but well remember my parents, both born pre-war, always reminding us how good we had it compared to their pubescent years of rationing, bombing, blackouts, bomb shelters and fear. The tv of my childhood and youth was war films, “Dad’s Army”, “It Ain’t Half Hot Mum” etc. I was bored witless by what I conceived (maybe/probably incorrectly) as irrelevant wittering and wallowing in a miserable past. I decided to live a flamboyant future but home was in a (now defunct) Royal Dockyard (so lots of Royal Navy) and Army conurbation which was drab, dreary and unnecessarily violent towards people like me, by both Navy and Army personnel, as well as local police and not to mention the populace, in a way that would be unimaginable now. Or so I’d like to think as I’m not so sure…. every time I visit family still living there, I feel I am stepping back in time and on to another planet. I feel old prejudices not only survive but thrive and are barely contained. My whole family voted for Brexit. I voted Remain. We discussed it at length just the once, the weekend after the referendum result when I visited. It was a heated debate that none of us want to repeat, but it disclosed ugly prejudices about Afro-Caribbean people, Muslims, and gays (how any of them relate to leaving the EU was beyond me but… people, huh?). The English like to see themselves as proud, cultured and strong. I know. I’m English and feel those sentiments sometimes. But what Brexit has exposed is that many English (not all) are mostly frightened and weak, won’t fight for a future worth having and run to Nanny (aka the Conservative Party) any time life gets demanding. We have had a Conservative/austerian-led government for the past 9 years (although the end-period Brown Labour administration was already beginning to dismantle the welfare state consensus – yes Yvette Cooper, aka Mrs Balls, and James Purnell. now a head honcho at the BBC, I’m looking at both of you. The welfare state is seen as a soft option for those who won’t (not can’t) look after themselves. The population as a whole is complicit in its demise. Some of us fight, but it’s hard work. The EU is seen as an imperial Soviet style evil empire, implacable in its demand that we are subservient to it. Strange how many people retire to France and Spain once they reach pension age (but those current emigrants – I think the figure is about 1.4 million – were not allowed to vote in the referendum). Rant over, and thanks for getting this far. IANA psychologist, but I see that in a non-professional environment – especially family!, people really really just uncork everything regardless of the initial subject. As long as that subject is emotional, *all* subjects that are emotional come out. It’s like the brakes overheat and down the hill we go faster and faster. This is one reason why history will look kindly on Andrea Jenkins, an ERG head banger for sure, but she ended the political career of the brains behind Gordon Brown and the UK apostle of Larry Summers. For that, one should be grateful. Col Smithers. You are right about first generation Ugandan Indians but my experience is different with the second generation. They didnt seem to hold a grudge. Saying that, not one of my school friends could ever get through a week without talking about what his family had lost because of “those people”. Strangely, I dont remember this with the one white Zimbabwean I met at school. Thank you for the color on Davis. Hadn’t heard and everything makes so much more sense now. As one who is a pessimist taught by experience, I still have to remain optimistic that some arrangement will eventually emerge that will keep the peace process alive and acceptable to the vast majority of people in Ireland. Or so I tell myself. The GFA occupies a space in many nationalists and republican minds as an achievement in and of itself. The asymmetrical relationship nationalists found themselves vis-as-vis to the various powers in the six counties after partition was somehow negated for good, or so we thought. As someone else mentioned, the current power structures in London have scant regard for many regions of the UK outside the hallowed areas of London, the South East and some regions of the East. So maybe some people in Ireland and the UK can all find common ground to maintain peace without giving up our individual sovereignty* to those who projects and policies are inimicable to our own. The Blame game just acknowledges that the dreaded political vacuum has returned. The problem is the GFA is a product of its time and the leaders, who mostly sort-of a lot but by no means all the time, justified the use of that description. It worked because they made it work. They made it work because they’d tried the previous failed approaches and knew, first hand, they failed. The current lot know nothing and have forgotten nothing. I’m quite happy to ladle out my displeasure at both the DUP (who should have a monument built to their intransigence as it is, a-hem, monumental) and Sinn Féin who inexplicably got totally clueless about politics in NI (I suspect they took their eyes off the ball and spread themselves too thinly concentrating their escapades in the south) having flounced out the Assembly just when it was becoming a fulcrum and, having flounced out, fell straight into the DUP’s trap by almost — but not quite — removing preconditions to resuming devolved government thus allowing the DUP to state, not without some logic, that you can’t have would-be administrators only agreeing to administrate subject to certain conditions. Finally, just to complete the gutter ball of failure’s final roll off the end, there’s the “moderate” parties like the UUP and the SDLP (and, I suppose, I must mention Alliance although I can hardly be bothered to type it out) who the electorate have ignored largely because being “moderate” is a leitmotif for policy, not a policy in and of itself. While Brexit might well be a nail in the GFA’s coffin, like the unfortunate victim in Murder on the Orient Express, all the actors took a turn in wielding the knife. Oh boy! How times have changed! May I tell a you a short story? Years ago, when ETA decided to abandon violence, by chance I wrote a comment on the news appearing online in BBC international edition. I was soooo happy about the announcement! The BBC read my comment and invited me and a few other spanish guys to talk about it in a live radio program. I was surprised by the invitation and I participated and remember very well that I could not restrain my happiness during the debate. The end of ETA terror (as well as previous terror contra-terror practiced by some misguided state representatives) was excellent news. So, how one cannot see the Good Friday Agreement as an unparalleled, happy, almost sacred achievement? How things have changed in Britain from that sensible approach to terrorism in Spain to this no sense about Ireland? The BBC, like almost all the UK press establishment, has always refused to see any analogy between Northern Ireland and other conflicts around the world. If you only knew about Northern Ireland from viewing British TV, you wouldn’t actually know that NI was part of the UK. Its a little like Americans suddenly discovering that Puerto Rico is actually part of the US. This could be seen particularly clearly when the Conservatives did a deal with the DUP. The British media adopted a complete blanket ‘see no evil, hear no evil’ approach, ignoring the DUP’s long association with terrorism, sectarian murders and associations with far right racist groups worldwide. Its quite common for British commentators to talk about ‘the dangers of the far right getting elected to Councils or Parliament’. The far right already has seats and is supporting the government, its called the DUP! I see. Turning a blind eye when needed. The British upper class has a long history of such practice. A famine here, a massacre there. Fake news is not a new phenomena. Well, the whole media apparatus had just focused its entire General Election coverage on “terrorist sympathiser” Jeremy Corbyn. It worked, to some extent, but the hypocrisy with regard to the Conservative/DUP tango was, and still is, astounding. I though Corbyn was just “antisemite” but “terrorist sympathiser” too… wow! And “Marxist” and a “threat to national security” too! All directed from HQ at his vegetable allotment. Yes, there are analogies, but to be fair there are differences as well, and you have to be extremely careful what you argue. Part of this attitude (which I agree is unreasonable) is a result of the battering that the British got in the 1970s and 80s from the foreign media and politicians, especially in the US. This, remember, was at the end of the de-colonialisation era, and there were independence wars still going in Angola, Mozambique, Namibia and, in a sense South Africa. The British had just pulled out of Aden and were leaving Singapore. So it seemed logical to some people to argue that really N Ireland was “just like” Aden, and the problem would be solved if the British just pulled out. Likewise, when I was at university, any passing Marxist (there were lots of them) would tell you that the IRA were the legitimate representatives of the Irish working class, and the British were using religion to divide the working people against each other. And the US media and political system would believe anything – not least that the Troubles were caused by the British Army invading the Republic. Which just goes to show that the British establishment, for all its faults, has no monopoly of ignorance about the province. I would add that the UK MSM has a similar blindspot about the British empire. My grandmother, an Ulster Irish catholic consistently voted for the Reverend Ian Paisley. Most of my relatives were republican with a small ‘r’ but voted Unionist. They were entirely pragmatic. They were better off under the British. Now she had 8 children and only three of them lived their lives in Antrim-the rest split to the winds. I have 5 cousins left in the wee six. They, their children and grand children are now most definitely Republican with a large ‘R’. I have no knowledge of how the British in Ulster feel and would welcome it if they shared their views on this site. I realise that the DUP have a loud voice, however they lost in the last Assembly elections and the Referendum and only speak for a minority in Northern Ireland. I suspect that their are many British in Ulster who are pragmatic and that they are not so different from my relatives. They will go where their interest takes them. I fear the reaction of the English when they realises that the “Irish Question” will no longer be any concern of theirs. Ian Paisley always had a surprisingly large catholic vote. He was an excellent parish pump politician and spread his bounty with a surprising lack of sectarianism. Yes, you touch on another topic which hasn’t always been appreciated in either Dublin or London. The lack of violence has made people think NI is growing more moderate. In fact, if anything its the opposite. On the Unionist/Loyalist side ‘moderate’ Unionists now support the DUP out of pragmatism. I was extremely surprised last year when a Belfast protestant couple I know – who live the sort of lifestyle that would send most DUP’ers rushing to the bible to protect themselves from evil – admitted to me that they voted for Arlene Foster. They said ‘but we’ve no choice, its her or Sinn Fein’. I couldn’t quite follow the logic of that, but thats what they said. On the natinonalist/catholic side, its the same thing. It used to be a rule of thumb that about 10% of catholics were committed republicans, with about 30% ‘sneaking regarders’ (i.e. not overt supporters, but in private probably were). The ‘moderate’ SDLP always had at least 75% or more of the vote during the Troubles. But Sinn Fein support is now mainstream, even among middle class professional catholics. Brexit in particular has hugely radicalised the catholic middle classes, a united Ireland is now very much in their interest and they know it. I suspect it is that during the years of violence, the armed groups scared the majority of their people towards centrist parties. But without the stigma of terrorism, people are now much more firmly aligned with their political identity. On the catholic/nationalist side, it also helps that Sinn Fein have been infinitely more skillful politically than any of their opponents. Thanks Yves. An interesting read. Just one quibble – I reckon Brexit is a negative-sum game rather than a zero sum.That is one of the reasons it is so toxic. I was talking a few months ago to a senior British General. He was telling us stories of the times when he was shot at when on duty at British defensive positions on the Irish border in the 1980s. Perhaps Arlene Foster thinks he imagined it all. As usual, the calendar has a lot to do with it. The writer obviously comes from the generation that grew up with the Troubles, but, for those older or younger, they were either a long, irritating, sometimes frightening period when bombs were exploding in London, or just another episode from history. Before 1969, there was virtually nothing about Northern Ireland in the media, nor very much about the island as a whole. “Ireland” was associated with music (Val Doonican, the Dubliners), literature (Joyce, Shaw, Wilde etc. etc.) and sentimental songs and stories. (My parents sang “Danny Boy” to get me to sleep in the 1950s). There had been some nastiness in then past, but United Ireland was something you learnt about in 19th century history classes and heard in quaint rebel songs. Ireland, with its obscurantist catholicism, seemed a historical relic in an age of secularism and rapidly changing values. This changed violently in 1969, and a shocked population watched violence on the streets of the United Kingdom, and the first troops arriving. After that, with bombs in London, the whole tenor of British life started to change. There was a period in the 1970s when you would walk nervously past parked cars in the centre of London, where security checks and armed police appeared for the first time on the streets, and where you suddenly started to need passes and prior agreements to get into many buildings. Of course it’s a lot worse now, but it started then. For twenty years after that Northern Ireland was a running sore for the British, taking money, political time and energy and resources away from other things. Half the Army was retraining to go there, deployed, or un-training when it got back. And the province had a desperately poor image, as endless Secretaries of State made the ritual rounds of political parties, hoping to stitch together power-sharing agreements between “moderate” unionists, and the “mainly catholic” SDLP, as the BBC used to describe it. Indeed, if there’s anyone who really symbolised Ireland, in the wider sense, it would probably be Ian Paisley, fixture on our TV screens through the 70s and 80s, personifying a backward-looking, tribal, intolerant form of politics which most British people associated with Ireland as a whole. So it’s not surprising that after the GFA, Ireland, and especially Northern Ireland, slipped back into the collective British memory hole. It was widely thought that the Irish, trapped in Joyce’s history as nightmare, were nonetheless finally going away and stopping bothering us. So it’s entirely normal that a 48-year old Minister would have little knowledge or awareness of the province and its history. For most British people, they could not be forgotten fast enough. I don’t pretend that the above is accurate, let alone fair. But it’s a pretty faithful picture, in my recollection, of how these things were seen. And in the perfect storm that is Brexit, it’s another entirely ignored problem coming to strike from an unexpected direction. I was in London only briefly, on a project for four months in 1984. On the one hand, you could do the math and know that the risk of being a victim of the IRA was ridiculously low in statistical terms. On the other, the warnings were so pervasive, such as the signs on every bus and underground train (and the Underground was pretty nasty then too) about watching for unattended packages, plus the afternoon paper boys on the street calling out any new bombings, that you wound up thinking every time you got on public transport that you were taking a risk. It nagged at you even if you knew it wasn’t rational. Yves is right here. In the UK, between 79 and 98 (which is at least 10 years less than the Troubles were running), about 16 thousand people were killed in drink-driving accidents (which is a subset of driving accident deaths). That’s about four and a half times more than Troubles killed over the 30 years it run (~3500, half of which were civilians). It’s likely it’s actually more like 25 thousand people or more died in drink-driving accidents, more than seven times the dead of the Troubles. I doubt a family cares whether their loved one was killed by a random bomb, or a random drunk driving idiot. In fact, I’d say that the random drunk-driving idiot is more of a tragedy than a soldier killed by a bomb, who at least expect to be in the line of fire, unlike a victim of drunk-driving. That said, I never fully understood why “mass shooting” of five people is a tragedy worth front pages, but ten drink-driving accidents, killing say twenty people on the same day, is treated as “normal” and at most mentioned in a local newspaper page 4. I’m not sure most British people saw it like that, which is really the point. You could say the same about the number of women murdered by their partners, or non-white people killed in racist attacks. In the end, any deliberate-inflicted violence will always be much less common than accidental death. But you can do certain things to avoid deaths from drunk driving, like not drinking and driving. The point about the IRA violence was that it was effectively random, and could strike anywhere at any time. If you lived and worked in London, you could never entirely relax as you walked through high-profile target areas. A colleague from the Foreign Office recalled sitting in the office of one of their Ministers in 1991 and watching as an IRA mortar bomb flew over and exploded in the garden of 10 Downing Street (you could hear the explosion from a long way away). It’s this period of threat and uncertainty that the British are very keen to forget, and in turn one of the reasons why the whole episode of the Troubles was so quickly forgotten. To avoid being killed by a drunk driver, you have to avoid getting out of the door, and live above street level. In fact, last few years, it might not even be a drunk driver, just a mass murderer. With terrorism, it is more a shock value, and the relevant medialisation than the real human tragedy. Moreover, you can shock more a society that feels safe than one that doesn’t. So any IRA level violence in London these days would be a massive problem. My guess would be a perception of agency when driving, a belief in the possibility of evasion when one is behind the wheel. A belief that brackets risk. New Year’s Eve, the Fourth of July, must be careful. The perception of an effective response. Breathalyzers, checkpoints, public awareness campaigns, grassroots organizations with political clout. Mass shootings? The very consideration terrifies. The speed of the violence, the unpreparedness of the victims, the lack of training for evasion or resistance by and large, the chasm between those who perceive the ‘obvious’ solution–arm thyself!–and those who are repelled at the thought, abstaining rather than capitulating to an arms race. You, as well as David above, are looking at it from the point of person doing the driving. I’d like to point out that drink driving victims are most likely to be other drivers or pedestrians. Who have no agency here – you can’t even think about getting out of way if the driver is coming from behind if you’re an pedestrian, or if a drunk driver jumps red light etc. – there’s a million of situation where you may not be able to avoid an accident caused by another driver. The killings in Berlin, London, Canada, Melbourne etc. used a vehicle. Would it be really that much different if it was a drunk driver ramming into a crowd? But both you and David ilustrate my point – that people are more scared of “terror” attacks which, as Yves says, are still statisticaly quite unlikely, than much more likely daily occurence accidents, that are way more likely to hurt you. I remember walking the flat-coat while we had combat helicopters equipped with IR-floodlights scanning along the Thames around Abingdon and Sutton Courtenay where I used to live and work. The IRA bombed Didcot Parkway Station too while I lived in Didcot. Could have been caught up in that. At work we had posters everywhere on how to spot mail-bombs and spies and terrorists sympathisers. Numbers to call in case anything needed reporting. Very occasionally some woman in a very conspicuous British dress would follow one home driving a very visible armoured 4-door car (20 mm think widows). Probably one of the security services showing that they “had our number” in case we wanted to tell some Russians the practicals of our field of work. The phone was probably bugged since the quality and reliability of my POTS-landline and the 19.6 kbit/s dial-up internet, defied everything I was told about British Telecom and their many failings. There allegedly was an “IRA-pub” in Abingdon too, the IRA-bit I never spotted of course. I just went for a pint at whatever half-decent pub after the Sunday walk. Weird days. I can in a way understand that some people are nostalgic and how younger people does not remember the constant paranoia, A.K.A., “Situational Awareness” and vigilance when doing daily things. From the safe distance of 20 years it is all very “James Bond”, “we knew which side we were on then” and stuff. However, It would be just crazy to go back to even some of that. I’m not going into the blame game. It’s futile. Claims and counter claims can be made ad nauseum. The distal causes of the assembly collapse are many and complex; not least of them being a change in the UK government and perceived shift in that government’s attitudes towards nationalists in the six counties. As the situation currently stands the GFA isn’t about Sinn Féin, or the DUP, or Fine Gael, or the UK Tory party, or Taioseach Leo Varadkar, or Prime Minister Theresa May, nor has there been any sudden rupture in politician’s memories of Sinn Féin policy between Gerry Adams (former leader) and Mary Lou McDonald (current leader). the GFA ploy up the flag pole, and it met with a stony response. The complete lack of understanding and empathy of anyone to suggest using the GFA to get PM Theresa May out of trouble is breathtaking. There’s enough blame to go around. Everyone can dip their toes in that pond, but nothing can deflect that Brexit, especially if a crash out occurs, affects the native peoples of Ireland profoundly – native peoples who, for the most part, didn’t want the benefits of the GFA to be diluted or otherwise adulterated and didn’t vote for such an event. That all said, and I don’t quibble with a single word of it, Brexit — specifically Article 50 and the ability of any EU Member State to do a triggering of it — is an entirely permissible act. It was written into the TFEU, which every EU member ratified, including the Republic. The fact that it was poorly designed, inelegantly drafted and insufficient to achieve its stated aims, is hardly the UK’s sole fault. And the UK government has negotiated the Withdrawal Agreement, which is fully supported by the Republic, along with all in the EU27. This resolves the GFA impacts to the south’s satisfaction. The fact that it won’t currently clear UK parliamentary approvals because of the dysfunctional UK political environment is the fault of the entire population of the UK. We get the politicians we deserve. But to bemoan the DUP for objecting to it is to make a fundamental misunderstanding of what the GFA is all about. The GFA’s underpinnings are that the province should be administered with policies that achieve the consent of all communities. So that to infer that the DUP somehow don’t count is in itself not in the sprit of what the GFA is all about. Now, nationalists would no doubt claim in the strongest possible terms that they do not want Brexit. How, then, is Brexit being compatible with a commitment to all-communities consent? Unfortunately the GFA did not hand a veto on the UK government’s ability to govern the UK in respect of international treaties. These were explicitly declared as the UK government’s sole competency. The same applied to Scotland and Wales — where the same controversy and dispute rages. There is nothing in the GFA — and, for that matter, nothing in A50 — which has a little asterisk next to it (saying something like *except the UK, the RoI and NI, where this all doesn’t apply”). Given the close ties between Sinn Féin and the UK Labour Party, I would have hoped that Sinn Féin would be more vocal in telling Labour that compromise is the bedrock of the GFA, the Withdrawal Agreement is just such a compromise and, moreover, one which is agreed by the government of the Republic. Or that Labour would realise that for itself. But no. No-one wants to compromise. Everyone wants total and unequivocal victory. And in doing so are rushing headlong into the precise outcomes they claim they are trying to avoid. Not to forget that the DUP opposed the GFA, anyway. IMO, the main problem here is that no-one likes May’s compromise (well, it’s not really hers, it’s been more or less dictated by the EU, but.. ). May bears most of the guilt for this, as she’s constitutionally (heh) unable to compromise by the looks of it, and engaged in exactly zero attempts to figure out what would be an acceptable compromise to the UK – if, indeed, there’s any, which may not be the case. But the other parties, Labour the most prominently here, didn’t help at all, as everyone decided that compromise was bad. But maybe it is like ACW – the time for compromises is over, and the harsh reality that there are some uncompromisable groups in the UK, wielding quite a bit of power, must play out. Hopefully, it will not play out the way ACW did, with violence, for then, the UK would really be a failed state, much more so than any African or LatAm one (for those never really had functioning institutions). I have heard EU27 officials in London refer to the UK as a failed state. They say the EU has one in already, Greece, so another failed state on the edge of the EU would not cause much more trouble. Mind you, alot of the more libertarian writers in the US seem to think that Europe is a ‘failed state’ , and that Russia does not have much going for it. Having just spent the day walking around the Hermitage in St. Petersburg with my jaw on the ground I beg to differ. Then the contrast of the military hardware buildup to celebrate the 75 anniversary…. In our golden-age travels, we regularly cross paths with some English, whether they be expats, tourists or simply living in England. I always ask them about Brexit, and then their view of the Backstop. Limeys on both sides of Brexit usually tell me that the Backstop is merely a political device put forth by Brussels to create troubles. I then ask them when they last visited Belfast. None of them never have visited. Never. For those of you who have never taken a Belfast Black Taxi Tour, please google or duck-duck ‘Peace Wall Belfast’ and look at the images. It shames the Berlin Wall. Two years ago when we were there the bonfire pallets were already stacked two stories high, the gates still closed at night, requiring up to a 22 mile drive to get around to the other side and the building art of Bobby Sands is as imposing as when first painted. And the residents of the Emerald Isle we met don’t want the GFA messed with as the Troubles and the hard border are both haunting memories. The English simply don’t understand. The Backstop is not merely a political exercise. They simply do not comprehend, with their main concern whether or not they can stay retired in Malaga. Shouldn’t they at least remember the IRA and London bombings? Walls are usually reactions to deeper problems demanding more honest attention. Thanks for this. My son and I took the murals tour a year ago. He surprised our guide (Irish of course) with how much he knew about the troubles, as we’re from the U.S. I wish I could upload our pictures here to support your description of the facts on the ground. I was shocked they still close the gates at night, that a street still has wire mesh covering it to catch the debris periodically thrown over the wall. Naturally I asked our guide about Brexit. Without hesitating he said it would bring back the troubles. He looked so sad. Then I asked him what it was like to grow up during the troubles. It will be argued by most that the GFA isn’t about victory or defeat except for those who didn’t and don’t want the GFA to exist in the first place. After all, the i’s were doted and the t’s crossed. Pretty formal regulation of how political institutions should work and how political operations should proceed were ironed out in great detail. This is not to say that shades of change could not be accommodated, but it’s should be in no one’s interest to see the formal treaty as something of a toy to be pulled apart on mere whimsy. I believe only one prominent political party in Ireland didn’t sign onto the agreement; namely the DUP. While the DUP under Ian Paisley Sr. made the assembly work initially, the current leadership hasn’t been seen to be so reciprocal (from a mainly nationalist stand point) to make the assembly operate these days. Why would they now? As far as their concerned they’re at the big table. Christmas came early when the Tory party wed the DUP to stay in power. So be it. The rot had set in much earlier. The negotiation and context of the GFA took place and operates as much within the context of the EU as it does within the immediate nexus of the Irish-British context. The assembly, given the imperatives of the Irish-British dimension formally agreed, also isn’t exclusive to British mediation and remedy alone. It must be said successive Irish governments (probably to their chagrin now) failed to operate the legal procedures between the “West and East” as robustly as they should have. Nothing new there. One of the subtext’s of the GFA was the understanding that the assembly was to operate in a more neutral environment. Both the governments of the Republic of Ireland and the UK were committed to remain “neutral arbiters” of the treaty and the workings of the assembly. Since the DUP is in the UK government that neutrality is shattered. Anywho, in short, the GFA cannot be confined within a strictly British context, and it was never meant to be constrained within such a context. However, we find that it can be affect by such a context. There is a general hyperbole that the GFA is sacrosanct because it is seen as a treaty which ended some forty years of violence, so it’s worth is defined against the suffering and death it has ended, as opposed to the deals specific qualities (case in point the bit in the above where the main defining trait is it ended 3,000 lives and the next sentence uses the term “genius”) and so to be critical of it is synonymous with wanting the violence to return. It is fundamentally a treaty designed to end violence, as such it’s construction in part is rooted in (from the perspective of the mediators) placating the vicious, with a tissue paper thin appreciation for any deeper problems beyond the level of ‘culture’. For example one aspect of the treaty is the recognition of both cultures as equally legitimate, “all lives matter” kind of stuff, which gives you an idea of the spirit it was written in (akin to how a teacher gets two fighting children to shake hands without making any inquiry into what caused the fight in the first place) and manifests in weird ways, such as the disagreements over official use of the Irish language in Stormount, or tour guides in the republic being explicitly instructed not to mention William III’s homosexuality (despite the Taoiseach being gay). We’re clearly better off with it, than without it, but something built on compromise in reaction to and a wilful misreading of (much in the same way austerity is ignored as part of the Brexit narrative) an extraordinary situation is liable to crumple under duress, which is what it is experiencing now in the lack of compromise over Stormount, the DUP in government and the existential threat posed by a hard border. This interview with (legendary activist, google her if you’ve never heard of her) Bernadette Devlin is worth reading in full, but her comments on the Good Friday agreement and the institutions created and the people who benefited most are especially illuminating. Yeah, Bernadette Devlin McAliskey has some useful insights on the situation overall. UK Government policy is for there to be no hard border in Ireland. This is also the policy of the government in Eire. The Republic of Ireland is a member of the EU. If the UK crashes out of the EU without a treaty, it will be outside the customs union. If the UK wants goods to cross into any EU territory, it will have to go through formal customs procedures which, in this case, requires infrastructure on the border in Ireland. It will also means that UK lorries entering onto mainland European countries in the EU will go through formal customs procedures. So, it not only will happen in Ireland. Of course the Republic doesn’t want a hard border, but it is not about to leave the EU. We have done well within the EU. Additionally, the EU customs union provided a valuable geogrpahical context for the Good Friday Agreement (GFA) to be completed and implemented since the Irish border became irrelevant within the EU customs geographical area. Saying that the Republic doesn’t want a hard border isn’t the same as saying the government of the Irish Republic doesn’t realise that a hard border may come about if the UK crashes out of the customs union. I don’t foresee any problems with “third country” issues related to people going into Ireland or the EU whatever happens with Brexit. Canadians and USAians will fly into and out of Dublin after 1 April 2019 without any problems, and if you are venturing further into the EU without any problems once you pass customs in Dublin. Irish society isn’t suddenly going to collapse, especially in the Republic where Dublin is situated. There may be continuing disruptions with lorries leaving ports to the UK and so forth but hardly affects the normal lives of ordinary folk. Maybe PK can add a few remarks about Dublin in particular as s/he’s a native. They’ll be plenty of grub and drink to be had. As makedoandmend says, there really aren’t any foreseeable circumstances where there would be a problem at the end of July in Dublin. There would be a possibility of flight disruptions if you are going via the UK. Worst case scenario is that hotels are still trying to sort out their supply lines and so keep running out of Spanish tomatoes. There is the possibility of trouble in the North with border issues, but it will be very localised up there, and would almost certain to have died down by July, assuming a no-deal at the end of March. July 14th is ‘marching season’ in Northern Ireland, when there is frequent problem, but it never leaks down to Dublin. Last time I drove from France into Switzerland, and then back to France, there was no hard border. There is no requirement for a hard border between Eire and the UK, as has been discussed extensively elsewhere. The UK leaving without an agreement with the EU is just as much the responsibility of the EU as the UK, unless you think that the EU is some sort of infantile organisation that needs its hand holding when there is over £100bn of annual trade at stake. My impression is that the EU are attempting to use the Irish border as a lever. As a policy choice, this will in retrospect be seen as nothing short of disastrous. There is no hard border in Ireland because of the GFA and the common customs area that now exists since the UK is still in the EU customs union. The following link gives an extensive over view of the extensive bilateral trade agreements that exist between the EU and Switzerland that have been negotiated between the two jurisdictions. These type of negotiations have yet to be initiated between the EU and the UK and will only occur once the UK finally leaves the customs union after midnight 29 March 2019. In the meantime and in the event of a no deal (the UK crashes out of the EU) a customs border springs up between the EU and the UK, whether on land, sea or air. If one is not in a customs union, one is faced with customs checks – i.e. an economic border exists. It’s not a ploy. It is a fact of trading circumstance that takes place between nations and between nations and trading blocks. Why have the EU not initiated any trade negotiations yet (and I know what the treaties say, as so carefully explained by Mrs Malmstrom 2 years ago)? The vote was in 2016 and it is close to 2 years since the Article 50 notification. There is nothing stopping the EU proposing a copy/paste of the Swiss agreements, even at this late stage. That at least would be a decision that we could all get behind. The position of the EU in relation to the border in Ireland is telling and it says nothing good about the EU’s intentions. I wish treaties were simply cut and paste documents, but life tends to be more complicated when two parties are diverging rather than converging. Once Article 50 was enacted, the first priority was to settle the divorce decree, so to speak. The EU has accepted the current negotiated settlement but the UK has not. Such is the state of play. Hopefully the UK and the EU can begin negotiations about their future relationship soon. Both declare that they can reach a deal within ~two years, but Yves and other more knowledgeable people think this way too optimistic a time frame. I can’t share your concerns about the EU and its customs border. The USA, for example, has borders and it has every right to determine what and what cannot cross those borders. It is the same for every other country. The countries of the EU, who share common customs union, have an EU customs border. When the UK leaves the EU it will have its own borders and will determine what will happen with those borders. I don’t think Brexiters find anything untoward about their “intentions” about UK borders. In fact, it is one of their convictions that their intention is to take back control of that border. The European Treaties which the UK helped to draft and signed do not allow the EU to enter into trade negotiations with their own members. In any event the UK still cannot get internal agreement what it wants to seek in detail with regard to a trading relationship with the EU other than an unlimited supply of unicorns. How could the EU propose a copy/paste of the Swiss agreements? You do remember Theresa May and the Lancaster House Speech? Her red lines? Leaving the single market? No freedom of movement? No customs union? No role for the ECJ? Switzerland has used sectoral agreements to pretty much copy the effects of the single market. To do so they had to accept freedom of movement. Switzerland is even part of the Schengen agreement unlike the UK. But Switzerland isn´t part of the EU customs union. Barnier did produce a nice, easy to understand chart with the “stairs”. And how the red lines made everything but a Canada style deal impossible. And a Canada style deal means border controls. Not to mention that the EU has declared years ago (even before the referendum) that they wouldn´t repeat the Swiss deal. Simply because updating/re-negotiating dozens of agreements every time something changes in the EU takes too much time and effort. The Switzerland deals will be honored but the EU doesn´t want a repeat of them. Even if the UK wanted the Swiss deal, it would be impossible. Switzerland is a small country of 8M people, and the UK is ten times bigger, about 70M. There is no “equivalent cut-n-paste” country. All the other “almost no border but outside the EU” countries are tiny, not adding up in total to more then 1/5 of the UK. The closest “cut-and-paste” is Turkey. Is that what the UK wants? There is a lovely twitter thread from Richard North that tells the true story about the Swiss border. Well then you probably used smaller roads? There certainly are border controls and infrastructure because Switzerland isn´t part of the EU customs union. Permanently manned border controls are at each major road. Smaller roads might only be randomly checked or manned during the day. There was even a minor crisis a few years back because German pizza delivery services delivered pizzas into Switzerland without paying tariffs! And being cheaper than Swiss businesses. Which resulted in Swiss customs officials targeting German delivery services. You don´t declare the pizza you´re paying tariffs and punishment fees. And there are certainly requirements for a hard border “as has been discussed extensively elsewhere”. Sanitary and phyto-sanitary checks (checks of agricultural products, both plants and animals) are required to happen close to the border. For the simple fact that the risk of contamination rises the farther a transport travels inland. That´s why a Border Inspection Post has to be build near Calais. Not to mention checks for regulatory compliance. You didn´t forget the Brexit supporting politicians shouting “a bonfire of regulations” and “getting rid of red tape”, didn´t you? And how they (Gove for example) somehow expected the EU to declare their new British regulations as totally equivalent to existing EU regulations? And if they didn´t it would just show how mean the EU was? – the member states are responsible for inspections and sending reports to the EU. – The EU receives the reports and is responsible for supervision. – The ECJ enforces the rules and regulations. Once the UK leaves the EU, pillar 3 and 4 are no longer there. The UK somehow seems to believe that EU member states should trust the UK more than other EU member states? As in, trust us, while pillar 3 and 4 no longer apply to the leaving UK, we are still more trustworthy than your fellow EU member states under EU supervision. I’ll clue you in: the government of the UK is lying about the no deal scenario and the government of Ireland is also lying about the no deal scenario. Both markets (EU on the Irish border with UK, and the UK on the EU border in Ireland) are obliged to put up a border in case of no deal due to WTO MFN rules. If they don’t put up a border under no deal terms they are unable to have any border controls anywhere without falling foul of claims under WTO DSM. This is well understand by the government of Ireland as demonstrated by Coveney having been caught talking about how they couldn’t be seen to have put up a border in no deal scenario and it is also recognized in the UK as just yesterday Greg Hands proposed violating the MFN principle in no deal circumstances by treating EU goods differently to the rest of the world. Way to go, let’s go swashbuckling under WTO terms but break the rules immediately. Is it clear why a backstop has been demanded when such morons and lunatics have risen so high in British society? Watch out for malign American (both pro-NI and anti-English) $$$ pouring in to aggravate. Failures at I-NI border would fuel anti-NATO sentiment, which would make Putin happy, too. Another Great Game is afoot. Picking nits, but sometimes they matter: ” the UK had an “internal border” with Ireland. “, quoted above, is ambiguously worded but correct: the border is internal to both the island (geography) and the EU (politics). Both of those are important. Even more important, it is being TREATED as an “internal border,” barely visible, and everyone wants to keep it that way. Except, maybe, the DUP. Did Davis’s unfortunate wording reflect a lingering imperial attitude toward Ireland? Maybe, but he has a case that it didn’t. Once again: as of now, the options are a crash-out and a hard border in Ireland OR cancellation of Brexit, thus keeping the border “internal” in both senses. Only the second is in Ireland’s interests. I really don’t sense any upwelling in anti Irish sentiment, but there is a consistent reoccuring theme in English history of which the Irish has played a part. The reoccurring theme is that management have taken advantage of immigrants to undermine workers conditions and wages. Whether its slaves, Irish, Carribeans,Indians,Serbians Polish or Romanians a memory has built up that Immigration harms. That there is no differentiation between immigration, refugees and free movement or policing of workers rights is a consistent policy theme along with a misguided middle East policy. I stare in disbelief at politicians pronouncing clearly the most improbable. We will renegotiate, we can do other trade deals without an Irish border, trade deals are easy and will always benefit the average person, Theresa will change something, the EU will change the deal, we can postpone without a good reason.I think many of these people in power believe themselves and perhaps the root of this is that they were part of Mrs Thatchers yuppie generation (the entitled) in their early working years. The financial crisis has meant average person inflation above wage rises and less public services for taxes paid. Generosity has dwindled and the warmth of welcome to outsider as well. Throw in globalisation and its impact on jobs and wages and plain jealousy of the economies of Germany, Ireland ,China and Malaysia and there is a toxic mix of sentiment.People yearn for the good old days. Those now remote from the work place or decision making fail to understand knowledge specialisation ,huge investment for new products or complex supply chains mean rule making has to converge. Brexit might be a perfect storm of factors. I guess I should be cross, but the reality this is mostly driven by fear, jealousy and misunderstanding. It is disappointing that many politicians are so sloppy with detail it colors and twists the conversation. I guess I just want to say personally as an English person I don’t bear malice ,least of all to the Irish and I want to apologise to the Irish nation for any impacts. Nor do I hate those who are struggling to find the next meal for their children ,are hounded by government and want change. Kudos on that. Brexit is feudal enclosure and a coup orchestrated by dark money robber barons to protect their secrecy jurisdiction structures. I assume you are referring to The City? If so, I couldn’t agree more.